ROKA COMMUNE, Battambang province – As at least 16 more villagers in Battambang province’s Roka commune tested positive for HIV Wednesday—bringing the total number of positive tests over the past week above 100—provincial police began questioning the unlicensed doctor whom villagers suspect of spreading the virus. About 105 villagers, including 19 children, have now been found to be infected with HIV since the Roka commune health center began preliminary testing for the virus on December 8, creating a public health panic with little precedent in the country, which has been largely successful in curbing an HIV/AIDS epidemic that peaked in the late 1990s. Ninety of the patients who have tested positive in initial tests at the commune health center over the past week had a second test at the provincial referral hospital Wednesday and 89 cases were confirmed, according to Mean Chhi Vun, director of the Health Ministry’s National Center for HIV/AIDS, Dermatology and STD (NCHADS). Many villagers are blaming Yem Chrin, an unlicensed doctor who frequently made house calls to many of the commune’s 8,897 residents, for the outbreak, said Hea Sik, head of the Health Ministry’s HIV/AIDS program in Sangke district. A raging fire in Phnom Penh’s Meanchey district destroyed 22 homes early Wednesday morning as local villagers struggled to quell the flames and firefighters scrambled to gain access. 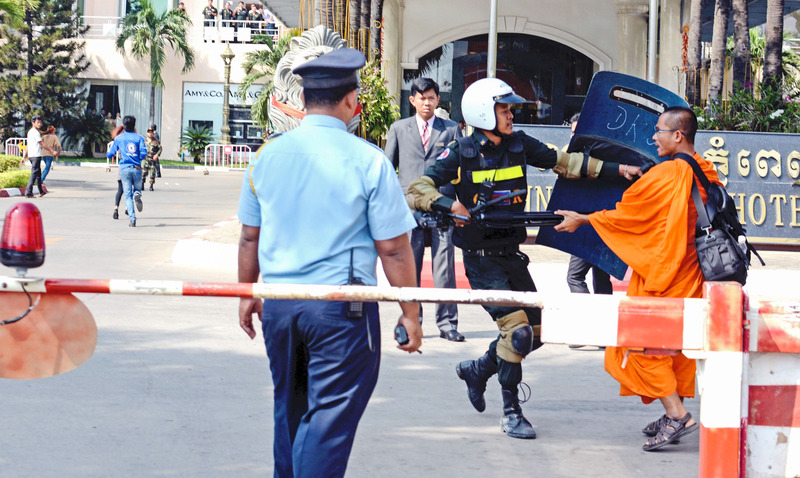 At about 1 a.m., an electricity line snapped and sparked the fire, Phnom Penh Fire Department bureau chief Neth Vantha said. It quickly spread despite villagers using garden hoses, ice blocks and sticks to control it as firefighters slowly arrived on the scene in Chbar Ampov II commune. Once on the scene, at least 15 minutes into the fire, firefighters helped villagers save a neighboring pagoda from the inferno, but 22 homes and a furniture business were completely destroyed. No one was injured in the blaze. Supporters of independent Beehive Radio and its director Mam Sonando defied a government ban on public gatherings on Monday and staged a protest march toward the Ministry of Information over its refusal to grant Sonando licenses to expand its broadcast range and establish a TV station. 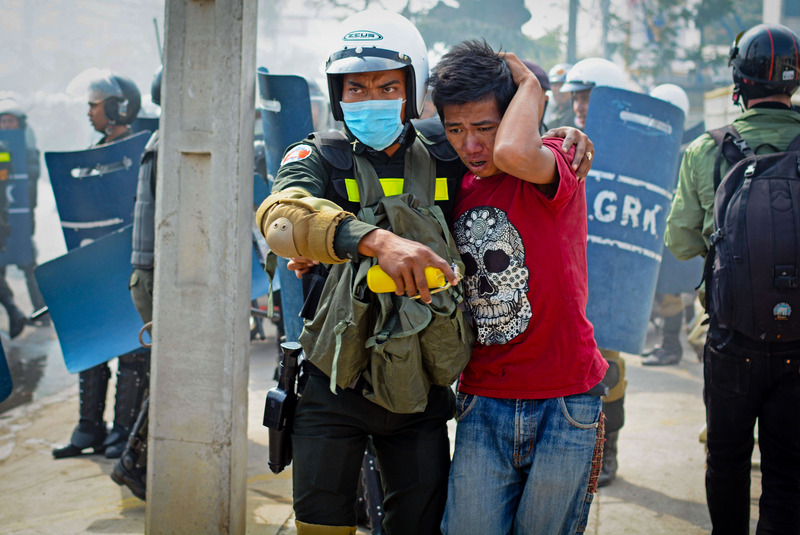 Cambodian authorities violently dispersed the protesters using electric batons and smoke bombs, leaving a handful injured and bloody. 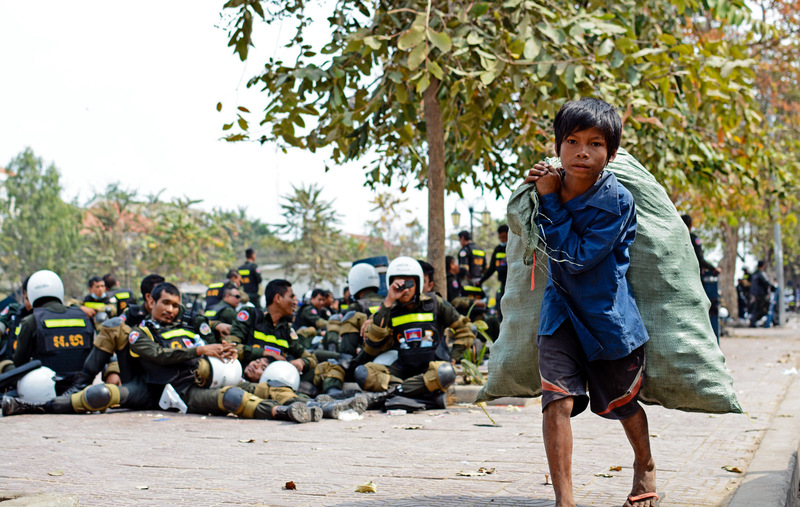 After protesters gathered and were violently removed from Freedom Park, where they were demanding the release of 23 people detained on January 2 and 3 be released from prison, a young boy found opportunity—military police discarded hundreds of water bottles and the boy quickly collected them to exchange them for change. The boy, calmly tip-toeing around police taking a break in the shade of trees, caught my attention as I noticed his bag full of plastic bottles was nearly as big as him. 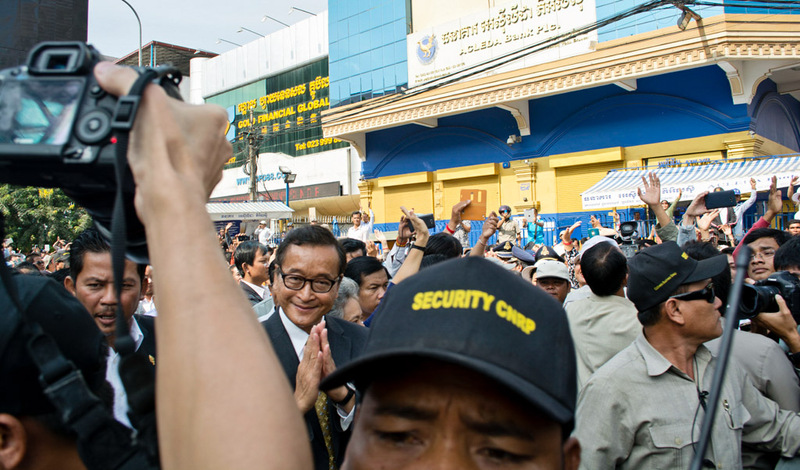 Thousands of CNRP supporters gathered outside the Phnom Penh courthouse Tuesday, in support of opposition leaders Sam Rainsy and Kem Sokha who were questioned over alleged involvement in labor protests that turned violent earlier this month. 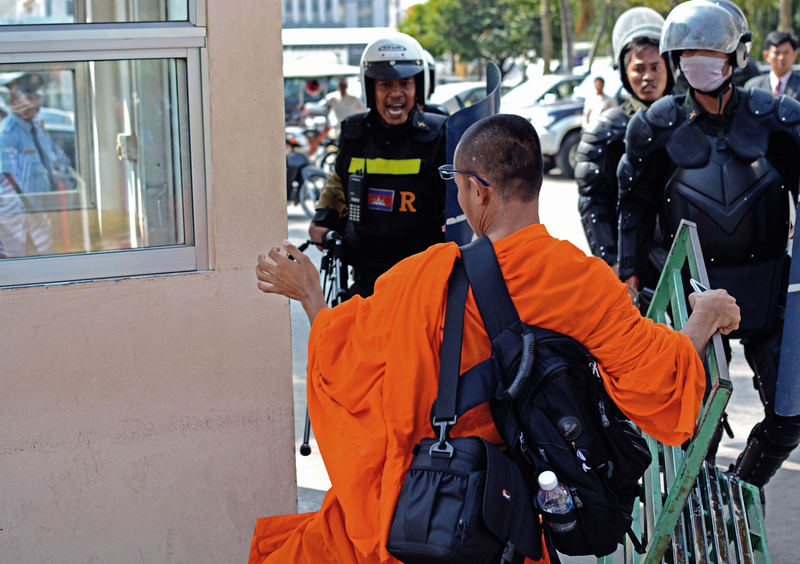 Prosecutors questioned the leaders over their connection to demonstrations, on Veng Sreng Street, that were violently suppressed by military police who killed five workers and wounded more than 40 others.